Railcraft® aluminum railings are designed for today's outdoor living areas. Whether it’s new construction or renovation, the backyard or a high rise, painting and maintaining your railings are a thing of the past! Unlike wood or wrought iron, Railcraft® aluminum railings will not rust, rot, peel or need repainting. 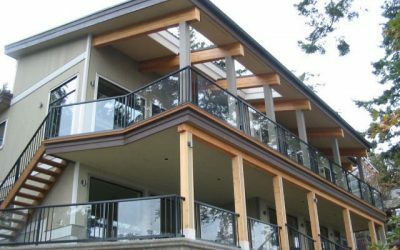 Railcraft® aluminum component railing systems are built and installed to give you years of carefree enjoyment, while adding value to your home or cottage. It reduces material and labor maintenance cost, when compared to traditional wood or metal railings. 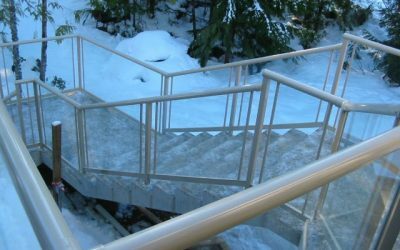 Railcraft® powder coated railing systems are salt water resistant make them ideal for installation in coastal regions. Their innovative designs are engineered to achieve the ultimate strength while providing a system that is aesthetically pleasing to the customer. Railcraft® aluminum railing systems can be installed both indoors and outdoors in residential or commercial applications. *The additional charge is approximately five dollars per foot. Railcraft® top rails, posts and components are coated with TGIC polyester powder. Because of our unique process of powder coating, many problems and issues inherent in liquid finishing are eliminated or minimized, as powder coating does not run, dip or sag and results in significantly lower reject rates. Powder coating provides a wide range of performance properties, offering excellent resistance to corrosion, heat impact, abrasion, fading from sunlight and extreme weather. The result is a uniform, durable, high quality finish that is also environmentally friendly. Railcraft® rails, posts and components are fabricated with high grade extruded aluminum. Aluminum is 43 times stronger than wood. Compared to other materials, aluminum resists expansion and contraction due to extreme cold or heat. Ounce for ounce, aluminum is one of the strongest and most stable materials that exist for the North American climate. Since aluminum does not absorb moisture, it will NOT RUST, chip, shrink or crack. Posts, rails and components are engineered for maximum strength. Stainless steel screws are used to fasten the post’s bottom plate. We go one step further, by embedding the screws in urethane sealant; the penetration in the vinyl is sealed. Railcraft® posts are 1 5/8" (not 1 1/2"). Our top rails are continuous (no post interruption) giving you 20-22 feet of clear run before a connecting sleeve is required. Railcraft® is the perfect railing system for both commercial and residential applications, indoors or outdoors. 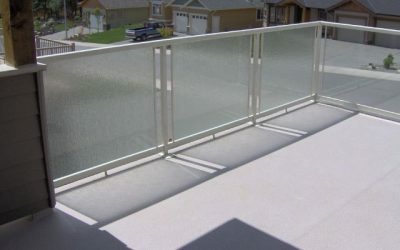 Our tempered glass system meets the Uniform Building Code, 1991 Edition, Section 1712a, Table 23-B, "Balcony Railing and Guardrails", and the National Building Code of Canada, 1992 Edition, Section 4.1.10.1 "Loads on guards", which are some of the most stringent in the world. Our railing systems are engineered to achieve the ultimate strength while providing a system that is aesthetically pleasing to the customer. 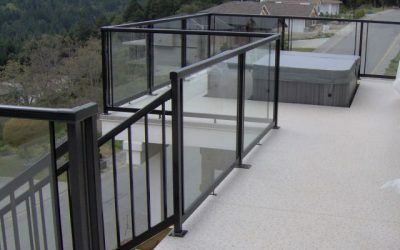 Our wide variety of Railcraft® aluminum component railing systems can easily be custom fitted to handle non-standard angles and configurations that are part of today’s decks. Our two rail profiles offer clean elegant lines that blend beautifully for both residential and commercial applications, indoors or outdoors. All glass and picket component systems are interchangeable; the railings may be all glass, all pickets or a combination of both. 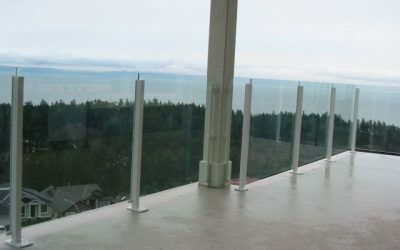 Railcraft® railings may be installed either on surface or fascia mount; on wood decks, over any waterproof surface, and our dedicated installers will seal the post lag bolts with urethane to validate that membrane, or on top of a concrete slab (smooth or aggregate). Architects and designers will appreciate the system’s ability to adapt to virtually any configuration you could imagine!